Joe Swift, Carol Klein and Adam Frost bring an exclusive look at the RHS Chatsworth Flower Show. We meet designer Jo Thompson as she prepares her show garden with a difference. Here in the cottage garden, the roses are all coming out at once. We have this lovely, soft, pink explosion. colours of the flowers accompanying them. continue to do so into July. we'll be bringing you the very best from there. show gardens, from the contemporary to the conceptual. Carol is seeking out the very best of the nursery displays. may have to adapt to cope with climate change. Poor old topiary Nigel's a bit swamped by forget-me-nots. letting light reach the yew so it grows good and strong. strongly enough, let alone having to compete for light with other plants. but by taking these out, that can now have all the light it can get. Come and have a look. Is that good? Do you think that's suitable? Do you recognise it? No. It's just a bush, isn't it? His poor old tail is thinning in old age. We all lose our hair a bit, but Nigel in his tail. I won't cut that until August. for the moment, keep it clear, keep the light and the air to it. I do need to clear away the forget-me-nots and do some planting. When I left for Chelsea, this bed was still looking good. clear it all away and start again. So, the forget-me-nots come out. It looks very drastic, just to rip out barrel loads of forget-me-nots. Don't worry, they WILL be back. The thing about forget-me-nots is they do self seed aggressively. You can see in this rich soil, it's very floppy. will stay more compact and act as groundcover. Have you come to help? You're such a big help! but I've also got perennials that I've grown from seed. These are the perennial foxglove Digitalis parviflora. They are a distinctive caramel spike of colour. foxglove, Digitalis purpurea, which the bees love. a shrub and they can reach six foot tall. These will never make more than about three or four foot. I've also got some lupins and at Chelsea, lupins were everywhere. a cut flower and that will mix in in the border. with a couple of dahlias and then plant around them. planting them is easy - just make a hole, bung them in. If they're permanently planted, then they should be planted much deeper. Right, let's start placing a little bit around them. They come in a mixture of colours. And this seed was sown last summer. need to be planted good and deep and that protects them. them that in this garden, so I treat them like I do a dahlia. and when it's finished, I'll dig it up in the autumn and store it. It's actually quite a successful system. This is not the final planting, so I need to add to it. But you do have to prepare for these seasonal changes. in order to replace it with the new. see growers presenting their plants and gardens at their very best. which I know is focusing above all on innovation and inspiration. preparations for the show were getting on. beautiful stately homes we have in the country. so the countdown is on for the first RHS Chatsworth. -Looks like it's coming together well, mate. -Any problems along the way? it's got a couple of days just to settle and all knit together. -I can pick up scent, as well. and you're kind of encapsulated by the plants. in the science of horticulture is everywhere at Chatsworth. which is ultimately what Paxton was doing, I suppose, 100-odd years ago. plants, for that idea I suppose it could be a rainforest. at the show is these free-form installations. the back of your head that you're going to be judged. getting a younger generation involved. One young lad that I've known for a few years is George Hassall. he's also the youngest ever RHS Ambassador. a problem, because we've got a great view from the terrace. what are you looking forward to getting in and seeing? Oh, I'd love to go in that little dome, there. That massive dome, I should say! I like water planting as well. new colour to the garden which can bring it to life. So, in years to come, where do you actually see yourself? Do you want to be head gardener here? That'd be really good, yeah! I'd love to. put a good word in! is the first to welcome the wider gardening community to his estate. You know, there's so much history. a bit tentative to start with, but we've got into our stride a bit now. -A lot of people are going to love the setting. I get that wonderful real excitement. a show like this, but has there been any moments when you've thought...? there's going to be some issues. We'll know more after this year. but we'll be EVEN better next year. -and I'm sure when people walk in, they'll really love it. Well, I'm sure it'll be a lot of fun. Here we are, fella - Chatsworth flower show. -It is stunning, isn't it? And look at the house - beautiful! -I didn't realise it was yours! two floral marquees and a whole new category of gardens, too. of having a judge walk on a garden. including the Great Conservatory over there. packed to the brim with an array of tropical plants. And I'm looking at the RHS Garden for a Changing Climate. some ideas from modern living and contemporary designs, too. Adam and I checked some out. them differently, however you want them. create seclusion and also change the planting. the front, so you're getting more seasons for your money, as it were. to make the most of them. Do you know, I love this little garden. part of a bigger space. Lovely and relaxing, but also it's simple, but clever. all the way through the space. You could use something else if these were too big for you at home. that that worked, but it does here. and that really starts to bring the whole thing together. Last but not least, is wild flower. but I love the way it's been customised. so it gets that edible twist on it. spent 20 minutes in this space here, I'd be more than happy. I have to say, it makes you feel like a kid again! there's no big white tents or fences there. Bit dodgy on the knees, there, but it seemed to work OK.
the movement of it and the wonderful reflective quality too. we've even got an extended view. it's designed by Paul Hervey-Brookes and it won Best in Show. this space at the back. be left with after the quarry? you've got to imagine a quarry being left and coming back to life. It definitely comes back to life. is picked up in the stone, but even in the gravel. naturalised, that we've brought into the country. You could do it at home, you know - gravel garden, lovely planting. And then as you come back, do you know what? but it's a massive undertaking. something a little bit different, Carol is in the Great Conservatory. amazed by this wonderful construction. country all manner of wonderful plants never seen before. from the tropics, both in our glasshouses and our gardens. where they make a striking addition to a courtyard garden. They're tender, so they need protection during the winter. Cannas originate in subtropical America. and in our own gardens. flame-like colours are just the job. but in winter, bring them in. These tillandsias are an absolute wow. which means they are excellent candidates as houseplants. They're just the thing to brighten up a dull day. but they're even better in a glasshouse. they encourage designers to let their imagination run wild. They can be any shape or size you want. For me, they have to really grab you visually from the off. you really want to find out more. have difficulties and feel powerless expressing themselves with words. that she had to approach it in a completely different way. and how it flows through that landscape. out over it and back again. what was I going to make this out of? and I realised that was exactly the right material. would sit well in the location it's intended for. so instead, I looked for something to complement them. Chatsworth and it's the first time I've seen it since October. it was naked, and now it's got all its clothes on! Look at this lovely green foliage. which does need to be a little bit drier. They're sculptural - they're going to be perfect. there's another beautiful native tree that I want to show off. which are going to be in the garden. but also to go with it. a completely different shaped leaf. in the autumn, flutter to the ground like helicopters. just joins into the grass around. creating a kind of veil as opposed to a mass. Chatsworth is a really exciting project. I've got total freedom in terms of space and design. constricted to a shaped garden, not being judged? swathes of perennial planting which looks fantastic. How have you actually put this together? Cos it's not just individual plants going in, necessarily. because it works well just under trees and coming out. You've got the lovely purples and dusky pinks of that. -so I immediately stuck quite a lot in. -You've got a lovely rose, too. would have looked odd by the river. and looking over the river, too. Well, I didn't want to hide the landscape. so in some areas we want to look through the planting. We've got tall planting at the front. People say tall and medium then low planting at the front. the water and the landscape beyond. you've brought this wonderful garden here. You can say, in many years' time, "I was there at the beginning". Yeah, I was the first! really are a time machine of plants. stand and it's absolutely lovely. for all that ancient ornamentation. introduced to the shores of Europe by Portuguese and Spanish explorers. There are more than 14,000 different cultivars. Most of them are very showy, but tender. to induce lots of flowering. If you want them to flower even more, then nip out the growing tips. a fuchsia fashionista from Yorkshire. she's been found to be completely hardy! and in our vegetable and fruit gardens, too. People often think of the tomato as coming from Italy. Surely it's Italian? Not a bit of it! tumbling down in that lovely hot, humid atmosphere. Spanish court, where it was looked upon with some suspicion at first. People thought it might be poisonous. but how delicious it was, it was given as a token to your lover. It actually had the name "love apple"
because it was believed to be an aphrodisiac. It causes the whole plant to collapse and the tomatoes to rot. But this is a brand-new variety, Crimson Crush. at all and what's more, it produces these big, gorgeous, edible fruits. Absolutely delicious in salad or cooked. hundreds and thousands of years of horticultural history. was busy preparing her plants at her nursery in Scotland. Well, I've got about 40 varieties of astrantia here. grow the majority of them myself to take to shows with me. they're good dried flowers, as well. They look lovely in the garden. They are really good for novice gardeners. water it in well, then they should do OK for them. but you'll always find one that will suit your requirements. 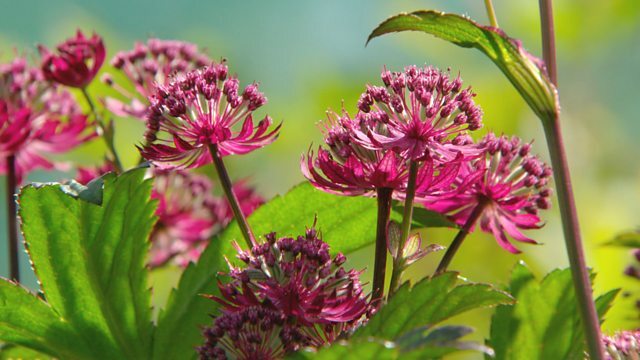 would be Astrantia Star of Love. a bit more sun, just to keep that really good colour. will tolerate drier conditions, shadier spots. They're just a bit easier to deal with those tricky spaces. the year, so some leaf mould or some well-rotted manure. you would be looking for it to double in size each year. a natural division in it, which you'll see in most of them. Replant and just water in really well. you want the astrantias to be in full flower. the display until the last day of the show. and see which varieties I'm going to take. so these could go on the display. because it has this stripe and it looks really good. it shan't be coming to Chatsworth. that's a nice plant that's really easy. They like the pink varieties. the judges are going to love it. but when did they first catch your eye? Well, you probably used them yourself! I have used them, more than once! They're a great working plant. They're great plants, they are, they're really good. herbaceous plants, that's what I say to it - what else are you bringing? some of the leaves, the shapes work really well with ferns. some will tolerate much drier conditions than others. Have you brought any new ones for the show? those are both relatively new, yes. -How long do you actually get to set up? And you've come a long way down from Scotland. Where do you stay? -I stay in the back of the van. It's fine, I'm used to it. so I get to sit and read of an evening, so it's quite good. -So how's the show been so far? You've seen the location, it's just... It's amazing. because it affects everything that we do. and we've seen that over the last few weeks, even days. Here at the show is a garden designed with just that in mind. So, Andy, tell me - what is this garden all about? on the impacts of climate change on our gardens, looking to the future. but we're going to get heavy downpours and heavy rain. So these plants need to be much more resilient to that environment. it's not a traditional fence panel that you've put up, why is that? stormy, more windy, as it has been here for the last couple of days. space that we can grow plants on, so it gives us more space for planting. are these trees in their sort of little greenhouse elements. them back in, so if it gets stormy, gets colder, we can push them away. So I'm hearing water in the background. Tell me what is going on with this. going into our combined sewer system. taking all of that water off the houses. rather than seen as isolated fragments of our urban landscapes. a wider role in the bigger environment. from the garden, thank you so much, Andy. growing these beautiful South African natives. and this was about 20 years ago. In a funny way, I think I sparked the interest. and agapanthus was just the next new thing, I think. a piece of cake - they thrive on neglect. it was just meant to be, I suppose. from the word go, even as youngsters. me to fill up with compost. really, you're all in it together. It's in our blood and we're used to it. with there being big flower shows, summertime's chock-a-block. It's a real family affair, really. I shall never retire, I know that for a fact. my son has taken over more. display plants ready for the public to see. We're virtually on the same page, we have our fallouts. I've got my modern approaches to working, if you will! to get the job done quickly. My dad likes the old-fashioned butcher's cleaver, you know. so I can do four or 500 in an hour and not half a dozen. allows us to multiply them. which is that big, fleshy root system there that you can see. cutting like a pie into equal sizes. You've got to look at the plant and judge it. I'll chuck a load of compost in around him. It doesn't have to be too fertile as long as it's free draining. you can never go wrong mixing the grit in, and that's all, really. difficult-to-grow plant, into a common plant now. I'm hoping to do the same with the clivias. if you can see a shadow on the leaves, it's too sunny. They will grow in shade when nothing else will in the house. nearly every house in the country will have one. right up to Christmas, really. and interest all year round as well. to be left alone to do my potting, my propagation, my pollinating. I do tend to just go along with the flow. You can't control him, he won't stop. Because like women with shoes, he sneaks the plants in. making the decision whether it's worthy or whether it's not worthy. And we want to tell a story, really, at Chatsworth. has developed and evolved over the years. we might change it in the end! -So, Colin, did everything go according to plan? so we had a job on this morning, but we're happy with it. -Yes, and the development of these plants. Now they're going to know you for clivias as well. Clivias are the new thing, really. hoping to make them more affordable and accessible for people. of your new ones, what kind of conditions do they like? they're putting on extra roots. keep them dry right from November until February. going into May - we're at the end of the season now. the end of December, so get them as close to zero as you dare go. and that initiates the bud in the plant, you see. we're looking forward to seeing loads of new clivias! -few days, haven't we? Hence the wellies! Adam, what's really grabbed your eye? -it's one of the best things here. -It's a strong garden, that one. I mean, it couldn't be better, could it? absolutely terrific stands and I love Hopley's one. Great long, narrow border that you could just roll up and take home! Oh, that sounds good! I might have to do that! Arit? -I've managed to find some dandelions. bridge and they're really lovely. -They're beautifully well observed, aren't they? thank goodness dandelions aren't that big! with scale, really, and using the landscape, as well. the garden and see the landscape beyond and it looks stunning. It really puts the garden in its place. Don't you call that borrowed landscape? -You sound like a designer! -All right, I know my place, Carol! -I think this show's got a great future, don't you? who's enjoying some pretty good weather himself. I think I've missed out, there. glorious historic setting of Chatsworth, that is a powerful mix. Well, I shall certainly try and be there next year. in the garden, here are some jobs you can do. the weeds are growing like mad. To keep on top of them, nothing works more efficiently than a hoe. Use its sharp blade to cut the roots just below the surface of the soil. and ideally, you'd do this in the morning of a dry day. hot, or even very cold weather at this time of year. This takes goodness from the bulb. and that will allow the bulbs more time to develop. Lily beetles can cause havoc on lilies and fritillaries. But they are very visible with their bright orange backs. and are almost impossible to see. of course, later, they are followed by hips that look like flagons. with the garden sort of stretching out like a cat into high summer. so let's see what the weather has in store for us gardeners this weekend. This is my favourite part of the garden at the moment. When I made it, about three years ago, it was a big gamble. But now it's acquired the heft that a large border needs. from quite bright if it's a glade to deep and dark underneath a tree. because we've run out of time. gardens and displays, we shall be celebrating our 50th anniversary. so do join us next Friday for Gardeners' World Live. There is an hour of gardens and gardening tonight, not only from Longmeadow but also the brand new RHS Chatsworth Flower Show. Set against a majestic backdrop, Joe Swift, Carol Klein and Adam Frost bring an exclusive look at the show. We meet leading designer Jo Thompson as she prepares her show garden with a difference. In the Floral Pavilion, Carol finds pioneering plants that have shaped the gardens of today and garden designer Arit Anderson looks to the future - meeting the team behind a garden built for the changing climate. Back at Longmeadow, Monty provides the ubiquitous jobs for the weekend.